I had never been to Georgie’s Alibi and was impressed with how nice the place was, in my mind I expected some gay dive bar (not that there’s anything wrong with being a gay dive bar). I found my way to their glass cabinet to look at the trophy (near the rear of the restaurant, keeps jokes to yourself). Georgie’s Alibi won the title of Best Burger (a Cinderella story type victory, their words not mine) at the Riverwalk Trust Burger Battle. I had not seen it up close and it’s just as nice or maybe even better close up (and bigger). At the Burger Battle I had tried a quarter of a burger but this time I was ready for the whole shebang. 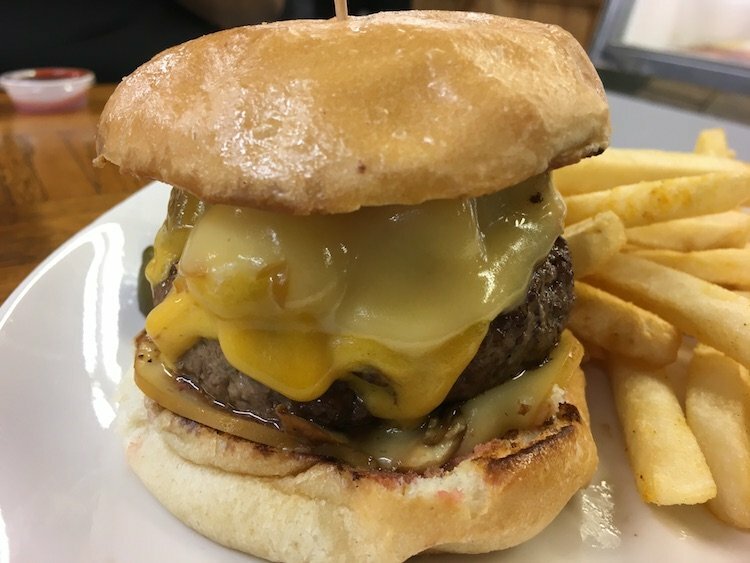 The Champ Burger (given its name after the big W) is topped with American Cheese, Chipotle Aioli and Caramelized Onions. What’s important to mention here is that the Onions are cooked in Butter and Bacon Fat. Yup! I know. Those combinations really work well together and again I found myself enjoying this Burger. Sure, there were fries served with the Burger but they became a non-factor once I took one bite of The Champ. As I’m sure you’ll find out too but only if you ever try one. It should be noted that this bar/restaurant is located in the gay district of Wilton Manors. Not that this is a bad thing, but it should be noted so somoene doesn't read this review and go there not fully knowing what to expect. That being said, they do have great food and some excellent drink specials most every evening.